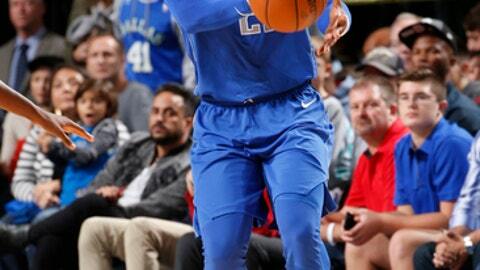 DALLAS (AP) The Dallas Mavericks’ first win in a couple weeks was quite a relief for Wesley Matthews and company. Matthews scored a season-high 22 points, and the Mavericks stopped a four-game slide with a 111-79 victory over the Milwaukee Bucks on Saturday night. Matthews also had eight assists while helping Dallas (3-14) to its first win since Nov. 7 at Washington. He had six of the Mavericks’ franchise record-tying 19 3-pointers. J.J. Barea had 20 points for the Mavericks, and Harrison Barnes finished with 18. Yogi Ferrell had 16 points and Dwight Powell grabbed 13 rebounds. Milwaukee had won four in a row. Giannis Antetokounmpo had 24 points and 17 rebounds for the Bucks (8-7), and Khris Middleton added 23 points. It was Milwaukee’s first loss since it acquired Eric Bledsoe in a trade with the Phoenix Suns on Nov. 7. The Mavericks never trailed after Matthews’ 3-pointer made it 22-20 with 3:07 left in the first quarter. Dallas went 19 for 38 from beyond the arc, including a shot clock-beating 3 from near midcourt by Barea that made it 88-64 in the fourth quarter. Kidd said his team should have been ready for the 3-point barrage. Milwaukee went 6 of 25 from 3-point range. Jason Terry played the final couple minutes for Milwaukee and got a standing ovation from the crowd. The 40-year-old Terry played for Dallas from 2004 to 2012 and helped the Mavs win the NBA title in 2011. Terry scored on his only field-goal attempt, leading to a large roar from the crowd. Bucks: C John Henson went 3 for 10 at the free-throw line. … Kidd had two stints in Dallas as a player and averaged 10.5 points, 5.5 rebounds, and 8.4 assists in 500 career games with the Mavericks. … The Bucks host the Mavericks on Dec. 8. Mavericks: C Nerlens Noel only played three minutes. Noel played six minutes in Friday night’s 111-87 loss to Minnesota and has been replaced in the rotation by Salah Mejri. … Dallas still leads the NBA with 14 losses this season. Bucks: Host the Washington Wizards on Monday. Mavericks: Host the Boston Celtics on Monday.